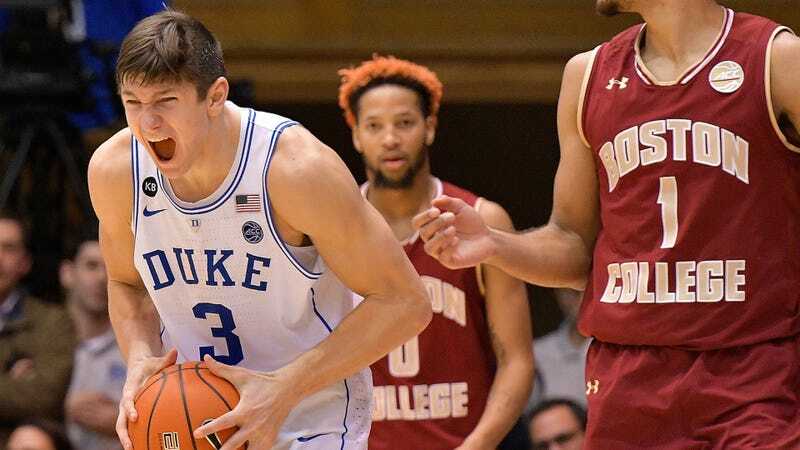 Grayson Allen’s “indefinite” suspension for lunatic play turned out to be only one game, and just one game after his return, it looks as if that may not have been long enough for him to learn his lesson. During yesterday’s game against Boston College, the junior was involved in something that looks to me more like an ordinary crotch kick than a trip attempt, but it definitely looks like something. The ACC, however, isn’t sure—the conference issued a statement to ESPN this morning saying “there is nothing conclusive that can be determined” as to Allen’s intent. Simple kinesiology, as Draymond Green would argue.